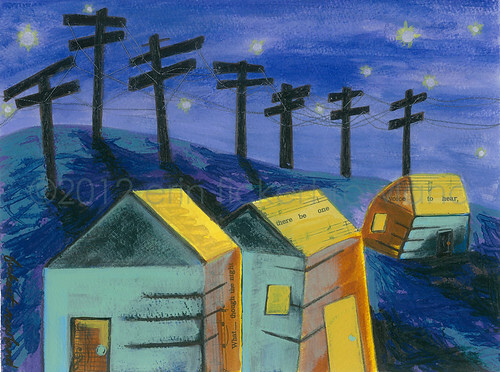 "Connected" is a series of three whimsical abstract landscape mixed-media paintings on paper. 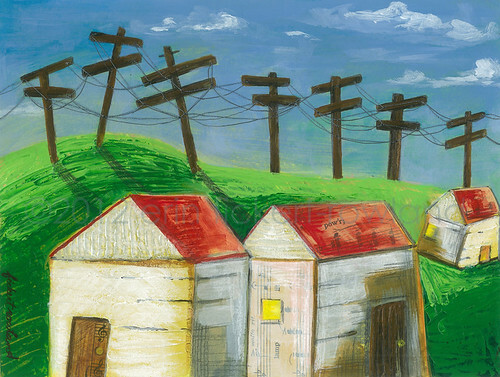 These depict simple countryside houses which are physically connected and interacting with each other, but also rely on the connection of mass-communication technology sources to reach the outside world. 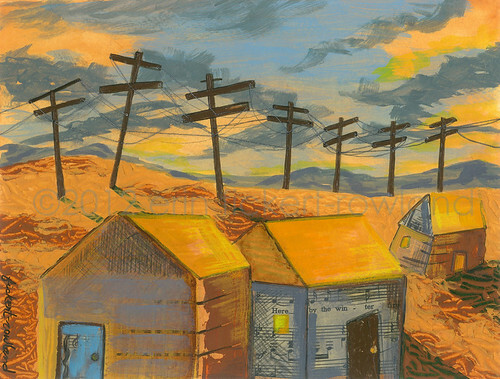 The composition has been repeated to explore what this scene would look like at different times of day. Each painting uses acrylic mediums in different ways to create a richly textured surface on 140# watercolor paper. Layered colors, vintage sheet music and sparkling thread contribute to vibrant images that are sure to brighten any space. I am really excited to announce that my artwork is now available to purchase as prints and note cards at FineArtAmerica.com. You can choose whether you'd like a print on canvas, paper or metal, or if you'd simply like an individual note card or set! You order directly from Fine Art America, using their secure checkout, and they print your products on demand, with a 100% Satisfaction Guarantee. I get a portion of each sale! and has been matted in white with all acid-free materials. 20 inches wide x 16 inches high. The original pieces are currently available for sale in my Etsy shop. 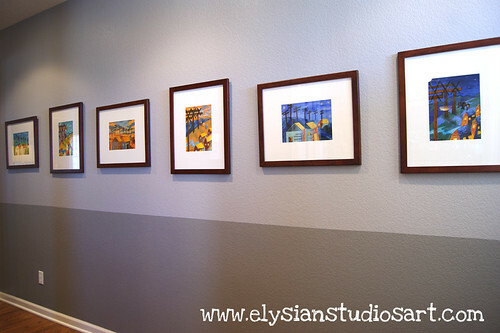 Click Here to see more detailed images, and what they look like framed. The "Connected" Series also coordinates with my "Drop a Line" series. ** I'm off to make more art, and you will see more paintings shortly! These are great! Especially like Sunset!! i am so drawn to this series. the colors and the feeling. i gravitate toward the twilight print...feeling a bit of vincent and also, the glow of light coming from a house at night is so intriguing to me. these are wonderful, Erin! Congrats on having them on FineArtAmerica! Thanks so much for your kind comments, Elizabeth and Christine! I am so happy that viewers are liking the different color palettes!